Happy Friday everyone! It’s the last Wrap-Up of 2013, so we hope it finds you well. Despite the holiday break, there were a few new beer releases and stories we wanted to share with you. • The PEI Brewing Co. has started a new beer series, in which they’re collaborating with Island chefs to brew new beers to be tasted and paired with certain foods as various restaurants across the province. They’ve released their first beer with Gahan Pub chef Dwayne MacLeod, a Munich Dunkel called Dwayne’s Dunkel Lager. A dark lager meant to be paired with “hearty winter fare”, this draft-only, 5.5% ABV low-bittered beer was brewed on the 7-bbl Gahan system in the traditional German way, with lots of Munich malt and cold-conditioned (“lagered”) to allow the flavors to mellow out. In the meantime, the brewers aged bourbon on whole vanilla beans and toasted oak chips; the extracted liquid was then added to the final, filtered product to result in an easy-drinking beer than can be enjoyed as a session beer or a slow-sipper. Described by the brewers as easy to enjoy with roasted vegetables, blackened meat, spicy dishes or rich cheeses, the beer mainly shines with desserts such as German strudel and French pastries. It’s currently available at the Gahan Pub in Charlottetown, and will likely pop up at a select few bars/restaurants in PEI and New Brunswick soon. Stay-tuned for more entries in the Island Chef series in the near future! • Garrison Brewing has released a special beer, almost a year in the making: they aged their Grand Baltic Porter in rum barrels from Ironworks Distillery in Lunenburg, NS for ten months. This is a very limited brew, with only 417 bottles available. This beer weighs in at 11% ABV, definitely picking up some tasty rum from the barrel (their regular Grand Baltic Porter is 9%). Tracy Phillipi of Garrison was kind enough to provide us with tasting notes: “With aromas of cherries & caramel, this ruby-brown specialty brew is balanced by flavor notes of coffee, smoke & leather. Not for the faint of heart, Barrel Aged Grand Baltic Porter leaves a dry warming sensation on your palate”. This beer is only available at the brewery, so pop down soon to grab a bottle. • The story of Garrison’s Spruce Beer was highlighted on last night’s CBC The National program. Watch the video to follow along with the fun, from harvesting the spruce and fir trees, to brewday, bottling and release. Brewmaster Daniel Girard talks about the impetus and recipe development he went through with this beer, and President Brian Titus speaks about his initial hesitance to brew up the beer. There’s still lots left at the brewery and even the ANBL, so pick one up before it vanishes for another year. • There’s a new beer on at the Hart & Thistle Gastropub, the “Off The Hop” India Pale Ale. Weighing in at 7.4% ABV and 52 IBUs (calculated), this beer features the Magnum, Summit, Cascade and Falconer’s Flight hop varieties, against a dry-bodied beer, allowing the hops to really pop. It joins Hop Mess Monster v4.0 and Dank & Stormy on tap. 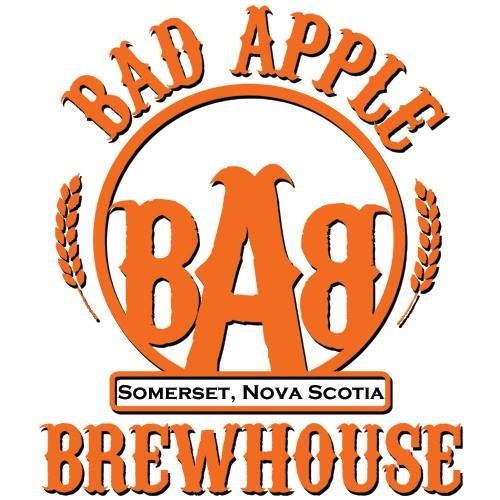 • Bad Apple Brewhouse in Somerset, NS has released some details on which beers and swag they’ll have available for next week’s launch: The 5.7% ABV American Pale Ale will retail for $4 a bottle, and $10 a growler fill (on top of the refundable $7 growler fee). When they are available in early 2014, bottles of the 9% Black & Tackle Russian Imperial Stout will retail for $6, and growler fills for $14. The 11.6% Glenora Barrel-Aged version of the RIS will be $8.50 per bottle. Decals will retail for $2, and t-shirts will also be available in limited quantities. As this is the last Wrap-Up of 2013, we want to thank you for following along with the Atlantic Canadian Beer Blog as we share the news and accomplishments of our local breweries, brewpubs, restaurants and bars. We’d like to thank everyone at these establishments who answer our emails and messages while we look deeper into the details of new breweries, beer releases and events, and wish you all the best in 2014. Remember to celebrate New Year’s Eve with a pint or bottle of beer from our excellent local craft breweries and brewpubs. Cheers from Shawn and Chris! • Bridge Brewing released a new, limited-edition beer yesterday for growler fills at the brewery. Glenora Barrel-Aged Strong Dark Belgian comes in at a hefty 11% ABV; the aging of the beer in the Glenora barrel adds “some vanilla, a greater depth of complexity, and whiskey on the finish”, according to owner Peter Burbridge. Only about 170 L of the beer was brewed, so get some now, as it won’t last long! Available at their Agricola Street brewery, or at the Alderney Landing Farmers’ Market this weekend. • Pump House has announced their latest seasonal release for winter – their Muddy River Stout, an Oatmeal Stout, has been available on tap for years at their brewpub and Barnyard BBQ locations in Moncton, and in select bars and restaurants in the Maritimes. This full-bodied, dark beer is described by the brewery as having flavors and aromas of “roasty malts, espresso and chocolate”, with a “big and lightly acidic finish”; it clocks in at 4.5% ABV. It is currently available in 6-packs at certain ANBL locations, and should be reaching all stores soon. For those of you in Nova Scotia, the beer should also be arriving at NSLC stores shortly after Christmas. • If you’re trying to think of what to do for New Year’s Eve (yes, it’s only a week and a half away), the new and already extremely popular Halifax beer bar Stillwell has an idea for you! They’re holding a “Mortal Sin” event, featuring the highly-rated Quebec brewery Dieu du Ciel! Cost of entry will be $20, and includes snacks from chef Graeme Ruppel, as well as a 5 oz glass of Dieu du Ciel!’s Bourbon Barrel-Aged Péché Mortel. The event begins at 9 pm, and seating is first-come, first-served. “Formal(ish) dress encouraged”. • If you’re closer to the Antigonish area, the Townhouse Brewpub and Eatery is hosting their own NYE event, a “Craft Beer and Local Food Celebration”. There will be three food courses from chef Jacob Buckley featuring locally-sourced food, and four beers from four of Nova Scotia’s newest breweries in 2013: Big Spruce, Uncle Leo’s, Boxing Rock, and, of course, the Townhouse. Beer trivia will also be included. It all starts at 6:30 pm; tickets are $60 and can be purchased in advance at the Townhouse. Following the dinner at 9 pm, there will be karaoke and an “open-mic confessional”. • And for the day after, PEI Brewing Company will be holding a Levée Celebration from 12-2 on January 1st. Featuring live entertainment and plenty of great beer flowing, they are keeping this tradition alive in their own special way. • We announced last month that Red Rover Brewing had their location confirmed, and were receiving lots of equipment and apples to start brewing their first batches of cider. At the time, they had planned on having their retail store open before Christmas so they could start selling merchandise and other swag; however, that opening has been delayed until after Christmas. On the bright side, they have started brewing cider, so we should be seeing their product in the area in the not-too-distant future! • We also mentioned last month that Les Brasseurs du Petit-Sault had started looking for two brewers for when they begin producing beer in 2014. This is just a friendly reminder that the application deadline for resumes is this Sunday, December 22nd. The official job posting can be found here; if you’re considering applying, don’t wait any longer! Also, they’ve confirmed that all their equipment has now been ordered – great to see that they’re one step closer to production! • And one more reminder, if you’re still looking for some last-minute Christmas gift ideas, check out the gift guide we posted on earlier this week. That’s it for this week; we at the Atlantic Canada Beer Blog hope that you all have a safe, fantastic, happy, beer-filled holiday! Merry Christmas!